Large Classroom Rugs take your students on an adventure! The next best thing to taking your students to the zoo is to bring the zoo to your classroom. We designed the Large Classroom Rugs to give you a teaching tool to help young children learn about the animals that live in the wild. Our colorful animal images will have your students asking questions and learning about lions, tigers, and bears. 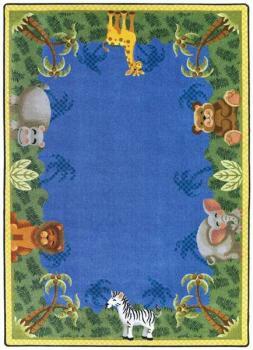 This rug is a great way for your preschool or kindergarten class to sound out new words. Your students will learn about wild animals, while sitting on a rug that provides supreme comfort. They can frolic all they want carpet and not cause damage to durably constructed carpet surface. Tightly woven fibers eliminate wrinkles and insulate your students from hot and cold classroom floors. Our antimicrobial treatment of each rug prevents the build up of harmful mold and mildew. The bright green palm trees that shade the animals on the Large Classroom Rugs will never fade, even as you roll out the rug for its 15th year inside of your classroom. Choose a product below. Please call 1-800-476-5427 to order by phone.